PhD : In Electrical Engineering University of Gifu, Japan - 2001 . MSc :In Electrical Engineering University of Gifu, Japan -1998. BSc : Electrical & Electronic Engineering, University of Peradeniya, Sri Lanka-1990. Senior Lecturer: 2001 to date Dept. of Electrical & Electronic Engineering, University of Peradeniya, Sri Lanka. Researcher :1995 to 1996	Gifu University, Japan. 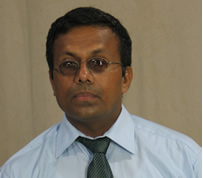 Research Engineer : Arthur C Clarke Institute for Modern Technologies, Katubedde, Moratuwa Sri Lanka1991-1994. Member of IEEE-Institute of Electrical and Electronic Engineering . Member of IESL-Institute of Engineers Sri Lanka (C. Eng., MIE). Electronics: Analog and Mixed Signal Circuit. Power Electronics: Multilevel Inverters and Control, SRM Motor Drives and Control, PV.